London Fashion Week means one thing to us and that’s getting the best creative talents at Secret Spa together to create the hair and make-up looks to put the finishing touches to RIXO’s presentation. 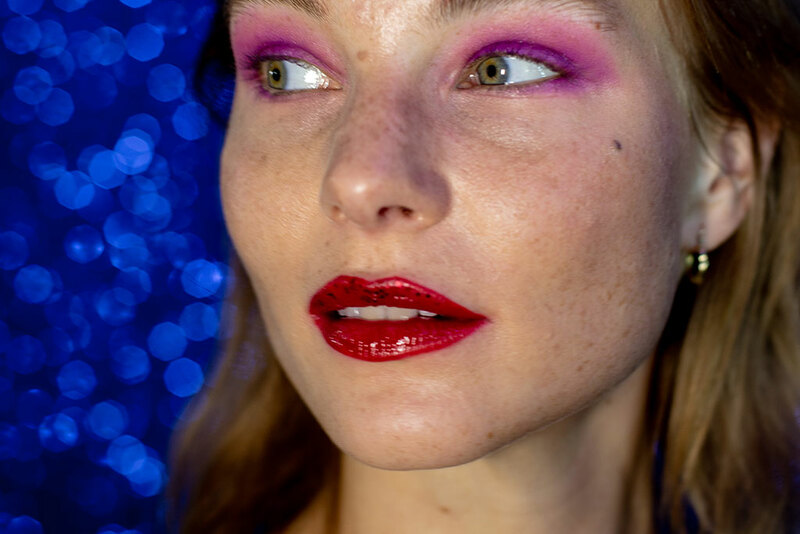 The ‘Liberated Territory’ collection takes its inspiration from the carefree hedonism of the 70s disco scene; like the clothes, the make-up and nails were awash with colour and glitter and hair was curled and backbrushed to Jerry Hall-esque effect. As always, it was a blast putting it together and working with two of the most talented and cool young businesswomen we know, Henrietta & Orlagh of RIXO. We can vouch that the presentation knocked the socks off everyone who went – hard not to with drag queen Rileasa Slaves commandeering the dance floor. Check out our beauty notes below to create the looks at home, start with the disco lashes! We promise you don’t have to be a model to pull them off. Step one: Apply a light base, using NARS Tinted Moisturiser followed by NARS Soft Matte Complete Concealer to hide any redness or blemishes. Step two: Apply generous amounts of Buxom Big Tease Mascara on both the top and the bottom lashes to create a messy, clumpy effect paying special attention to the tips. Step three: Apply Anastasia Beverly Hills Glitter Adhesive to the lashes and layer up to three times. Carefully apply a touch of Anastasia Beverly Hills Loose Glitter in Gold over the top lashes, holding a tissue underneath to catch any excess sparkle. Step Five: to shape the brows, use Anastasia Beverly Hills pencil in Granite and finish with Anastasia Beverly Hills Clear Brow Gel. Step two: Apply Star and Blue Ice from the Anastasia Beverly Hills Moonchild Glow Kit to the eyes, focussing on the inner corner and blending up into the crease. 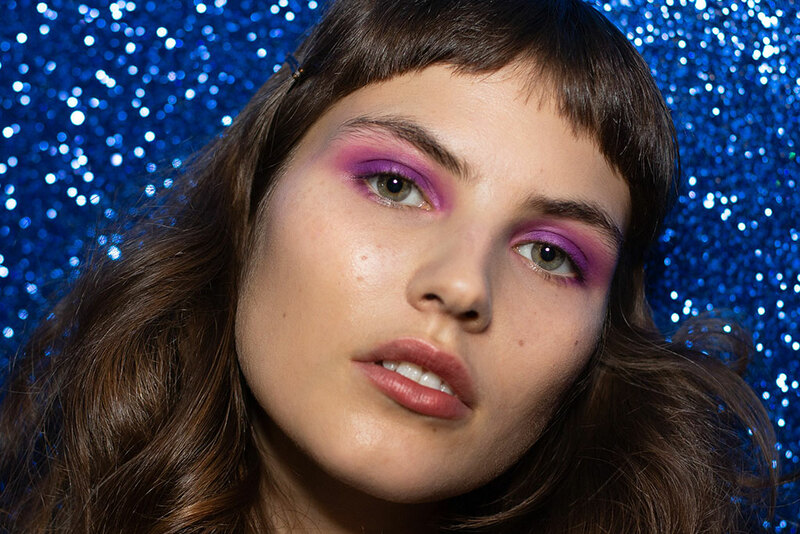 Add Electric from the Anastasia Beverly Hills Subculture Eye Shadow Palette on the inner corner for an added pop. Step three: Press Buxum Big Tease Mascara into the roots of the lashes leaving the tips clean for a natural and wide-eyed look. Step four: to shape the brows, use Anastasia Beverly Hills pencil in Granite and finialise with Anastasia Beverly Hills Clear Brow Gel. Step one: Outline the lips with NARS Jungle Red Lipline Penccil, overdrawing slightly for a full, rounded look. Step two Apply #3 from the Anastasia Beverly Hills Lip Palette to fill in the lip then mix #12 and #6 to create a shadow around the edge of the lip. Step three: Apply NARS Triple X Clear Lip Gloss then press Anastasia Beverly Hills Blazing Sunset Loose Glitter onto the top lip only. Step two: Working up the whole head, curl the hair in an upwards motion using the tongs, leaving at least 3 inches from the scalp. Pin curls as you go. Step three: Remove the pins smoothing the non-curled root area down using a heavy amount of Wella Shape Me Gel and a comb, this will ensure no flyaways are present on the top of the head. Once smooth place hair grips all around just above the curl so it can set. Step four: Separate the curls using your fingers to pull them apart in different directions to create texture. Once complete back-comb the curls with a comb to create a serious amount of volume while keeping the curl visible. Throughout this process ensure to use a good amount of hairspray to give hold. Step five: Remove the grips from the back of the hair and leave the front two rows in to give a touch of 70s glamour.